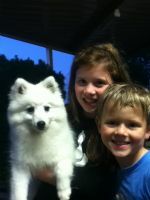 Tess is staying with Jake and Amy Tester to be a friend to Yuki their Japanese Spitz. Olly enjoying a romp in the last rays of sun before winter kicks in in Wisconsin. Mikomi looking gorgeous and now doing well in the Neuter classes. Siamese twins? No just BB and Meiko crashed out! This Tug-O-War game is easy! Santa grants Mick his Christmas wish and brings him a Bullmastiff! How cute - this is Morgan. Angel strutting her stuff like a pro. Angel wins Best of Breed and Best Minor Puppy in Show under Mr Pedersen of Norway. Angel looking pretty pleased with herself and her recent wins! Angel and Priscilla doing their best ABBA impression - Knowing me, Knowing you! Adana's new babies aged 2 weeks - 8 boys! Hmmm...Lyndsay after some hard work in the garden! Competing in the Breeders group for Daesdaemar - Priscilla is third in the lineup. Lindsay - Mannerking Drama Queen - soon to make her showring debut. Priscilla, now aged 2 1/2 years. Zabe, starting to look like a teenager! Zabe already looking like a professional! Zashi enjoying her last litter - Zabe and Chance are in there somewhere. Mannerking Chickara age 3 mths - Best Baby in Show winner. Champion Mannerking Adana, sister of Chickara and Crystal. Priscilla - Ch Daesdaemar Summer Wine age 9 mths. Priscilla and Debbie at their first Melbourne Royal. Typical Mannerking baby - Hudson. Della - Ch Mannerking Second Editn owned by Sandra Wornes and photo by Colleen Wornes. Della - light and nimble movement! Bill as a puppy in the ring. First female Grand Champion Japanese Spitz - Gr Ch Mannerking Special Editn. Faith - Aust Grand Champion Mannerking Special Editn, also multiple Royal Best of Breed winner. Jamie - one of the founders of Mannerking - Ch Napaj Kool Kustomer. Daesdaemar Breeders group - their dams are Ch Mannerking Memory Lane and Gr Ch Mannerking Special Editn. Paws walk in Goulburn. Jo and Shadow, Debbie and Shikia, Graham and Cocker Spaniel, Fudge. Debbies in trouble during a trip to the Melbourne Royal Show. Helping out on the farm - Zashi and sister Ishi. The dogs enjoying their picturesque surroundings.